Summer’s over, but don’t fret. Our five-part Ultimate Fall Golf Travel Planner will help you find the perfect destination for you and your crew. Up next is Part 3, our major-worthy courses you can play. (What you missed: buddies and bargains and sunny golf destinations.) One of golf’s many great pleasures is the opportunity to walk in the footsteps of our heroes—sometimes the very next day. Here are four extraordinary, major-worthy resorts where you can do exactly that. 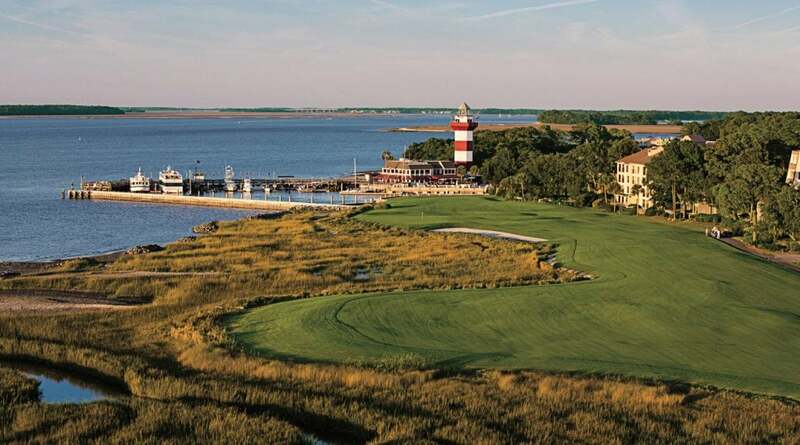 As end-of-round beacons go, it’s hard to beat the 18th at Harbour Town. HILTON HEAD ISLAND, S.C. THE RESORT Dramatic improvements in the past 48 months have elevated Sea Pines into elite company. 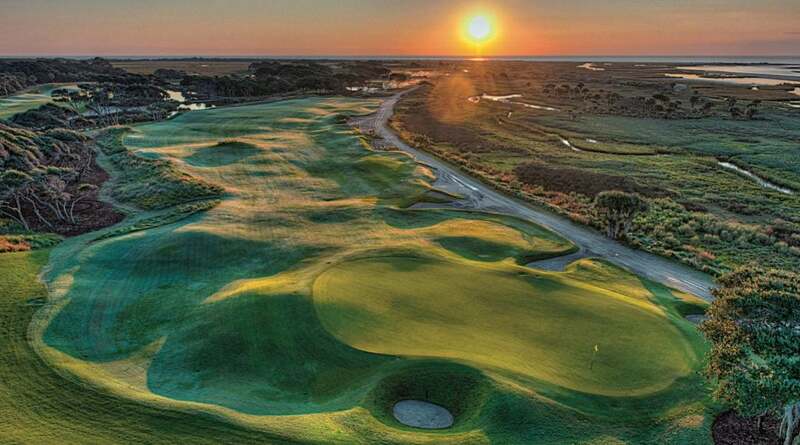 Complementing the villas, marina, beaches and family activities are a stunning new 44,000-square-foot clubhouse at Harbour Town that debuted in 2015; a new Plantation Clubhouse, which services Sea Pines’ other courses, Heron Point by Pete Dye and Atlantic Dunes by Davis Love; the Sea Pines Beach Club; and superb new restaurants and enhancements to the Inn at Harbour Town. THE FLAGSHIP COURSE Host to the RBC Heritage, Harbour Town Golf Links is a 1969 Pete Dye design with Jack Nicklaus consulting. Some of the smallest greens on Tour are guarded by lagoons, tree limbs and odd-shaped bunkers shored with railroad ties on the front nine, and by water and golden marsh grasses on the back nine. The par-4 closer is framed by the iconic, candy cane-striped lighthouse. MAGIC MOMENTS In 1969, a comeback win at the first Heritage by Arnold Palmer (he hadn’t won a Tour event in 14 months) catapulted Harbour Town, the Heritage and Hilton Head Island into international prominence. WHY GO IN AUTUMN Gorgeous temps—and the Ultimate Golf Buddy Trip’s Pete Dye Package starts at $383. 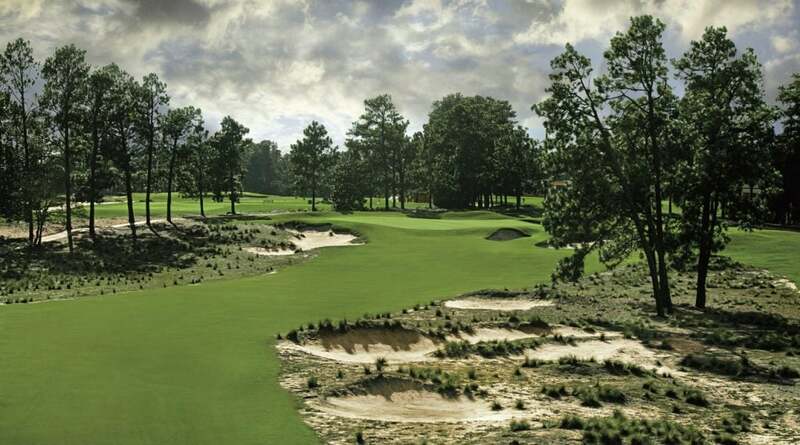 Immaculately crafted “natural” waste areas adorn Pinehurst No. 2’s 375-yard, par-4 13th. PINEHURST, N.C. THE RESORT At first glance, the Pinehurst Resort seems on the quiet side, at least looking at life from a front-porch rocker at the 117-year-old Carolina Hotel. But the place never stops evolving. Of its nine championship courses, most of the scrutiny this fall focuses on No. 4, a layout completely made over by Gil Hanse, who also debuted the resort’s par-3 course, the Cradle, in 2017. Both courses feature acres of exposed sand, evocative of the region where it sits: the Sandhills. The resort’s new 19th hole, the Deuce, is awash in memorabilia, and soon to debut is the in-town Pinehurst Brewing Company. THE FLAGSHIP COURSE No resort course in America oozes lore in greater abundance than Pinehurst No. 2, Donald Ross’ finest creation, circa 1907. Walking its sandy, hardpanned, wiregrass-flecked and historic terrain with a caddie is one of golf’s singular thrills. MAGIC MOMENTS At the 1999 U.S. Open, an indelible Payne Stewart sank a 20-foot par putt on the 72nd green to edge papa to-be Phil Mickelson by one. WHY GO IN AUTUMN Think of those pines—and the Donald Ross Golf Package, which starts at $585. Imagine it. This is just the beginning of your round—the 493-yard, par-4 first hole—on Kohler’s Straits course. KOHLER, WIS. THE RESORT In the heart of America’s dairy country sits what many contend is the cream of the crop of golf resorts. 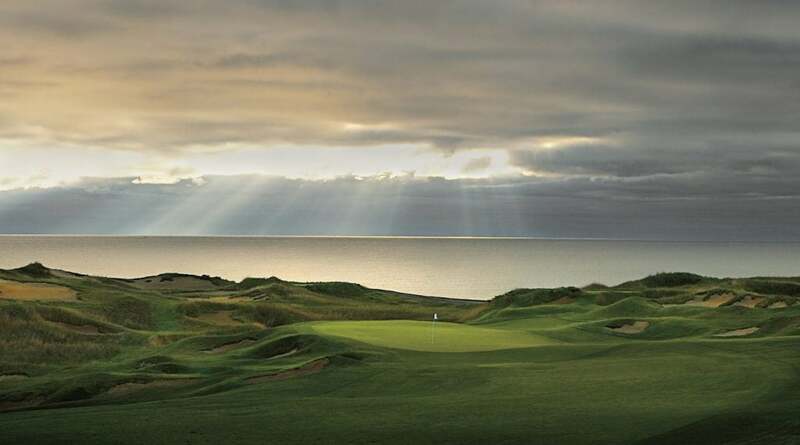 Guests can choose from four Pete Dye designed championship tracks, including Blackwolf Run and Whistling Straits, whose Straits course hosted its third PGA in ’15. Among the lodging options are the American Club, and for budget-minded travelers, the Inn on Woodlake. As you’d expect from America’s plumbing experts, the Kohler Waters Spa is one of the nation’s finest. Gourmet dining (and a world-class cheese selection) is on tap at the Immigrant Room. Still, don’t miss the casual fare at the Horse & Plow. THE FLAGSHIP COURSE Whistling Straits’ Straits course is a 1998 Pete Dye faux-links design on Lake Michigan that was once a poker table–flat military training base in World War II. Dye and owner Herb Kohler moved three million cubic yards of dirt and trucked in 7,000 loads of sand to create the hills and bunkers and relocate the bluffs back from the shore. All Kohler told Dye was, “I want the course to look like it’s in Ireland.” Mission accomplished. MAGIC MOMENTS The most notorious bunker infraction in history doomed Dustin Johnson at the 2010 PGA Championship. On a sunnier note, Jason Day broke the all-time majors scoring record for most strokes under par—20—in a stirring 2015 PGA Championship duel with Jordan Spieth. WHY GO IN AUTUMN The fall foliage and the Dye-Abolical Package, with rates that start at $991 per person based on double occupancy. The Ocean Course’s front-nine capper features a Pete Dye pot bunker to admire—but avoid. KIAWAH ISLAND, S.C. THE RESORT This 10,000-acre coastal property serves up ten miles of private beach, 30 miles of marsh-lined, forested paths and access to nearby Charleston, but golf is the top draw, with five championship layouts, among them the fabled Ocean Course and the Jack Nicklaus designed Turtle Point, which boasts several oceanside holes. Accommodations take many forms, but don’t miss the Sanctuary hotel. Its twin staircases off the lobby ooze Gone With the Wind noblesse, but the marble flooring and huge picture windows that offer Atlantic vistas are pure modern beauties. THE FLAGSHIP COURSE Pete Dye crafted the Ocean Course in 1991, just in time to host the Ryder Cup, and it remains plenty tough and remarkably gorgeous, its linkslike fairways framed by native sand, coastal vegetation and the Atlantic Ocean. MAGIC MOMENTS Twenty-one years after the Euro’s anguishing ’91 Ryder Cup loss to the U.S., a European avenged the defeat when Northern Ireland’s Rory McIlroy tamed the Ocean Course with a 13-under-par 275 to win the 2012 PGA Championship by eight shots. WHY GO IN AUTUMN Because Charleston is spectacular year-round, and the Sanctuary Golf Package starts at $417 per person, per night.